We had a wonderful relaxing weekend. The cabin was amazing. We will return! It was our first time to Bryson City and this side of the National Park. This place is so peaceful. Perfect for riding the rails at the GSMR. We went to Deep Creek. We loved the kitchen. IT was our first time to Bryson City and this side of the National Park. This place is so peaceful. Perfect for riding the rails at the GSMNR. we went to Deep Creek. We loved the kitchen. More pleased than what I had seen on line. We are a family of 50 or 60 something year olds who are retired. We have convertibles and love to ride the roads. Went to deep creek, Dragons Tail, and Road to Nowhere. Ordered pizza from Pasqualinos downtown brought them home and watched football, GA got beat so we drowned our sorrows in the hot tub. We will return, too much fun to be had. Congratulations on a fine cabin, good plan, good construction. We very much enjoyed our brief stay. Amazing! From the moment we opened the door we were very surprised of the beauty of the cabin & the rooms, especially the view! Thank you for everything. It was amazing! Cabin was fantastic The service from the rental agent was handled efficiently and quickly. 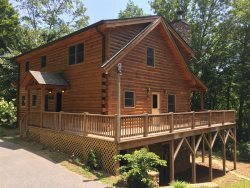 The cabin was fantastic; well equipped, and the location was convenient to entertainment and restaurants. The only drawback was the location very close to a public road. Manager Response - Sep 16, 2011: We're glad you enjoyed your stay. As a repeat guest, for future bookings you will receive a 10% discount off any of your cabins when you call to book. We enjoyed the very convenient location and large rooms. This was a well laid out home with plenty of room. It was easy to get privacy for reading or watching video that no one else wanted to watch. Plenty of storage for suitcases and bags. Comfortable indoor furniture. Complaints: 1) There was a dangerous gap between the walkway on the left side of the house and the main level deck. A small child could easily fall between the walkway and the house/deck; or anyone could step into the gap and be injured seriously. 2) There were only 2 outdoor chairs (rockers). No tables. This falls short of what guests need. 3) No curtains on the doors to the decks. My daughter hung a sheet up in her room. Blinds aren't required but some form of curtain to provide some form of privacy, especially in the bed rooms seems appropriate. 4) Address markers at the end of the driveway on the street. Manager Response - Jun 14, 2011: Thank you for your response. We will let the owner of the cabin know about your concerns. Please keep us in mind for future stays. As a repeat guest you will receive a 10% discount off any of our cabins.